Moodbidri, Nov 17, 2018: Presiding over Alva’s Nudisiri-2018 at Ratnakaravarni Vedike in Santha Shishunala Sharifa Sabhangana at Vidyagiri here, she said the history reveals that many religions embracing singularism had made violence as their all-time strategy over a period of time. From time to time, saint poets and litterateurs in Karnataka have been strongly expressing themselves against this unhealthy trend. Ideologies that deny diversity and pluralism are a threat to the society, Kannada University Vice Chancellor Dr Mallika S Ghanti said here November 16, Friday. Some efforts to destroy pluralism are carried out right from the micro level. Uniformity is imposed on curriculum, cuisine and clothing, which is a dangerous threat to the country’s diversity. This way, singularism will fail the idea of ‘unity in diversity,’ she said. “Agriculture sector too is a victim,” she said and added that farmers depending on monocropping end up losing everything. It is impossible to imagine a singular society. We are a plural society on the basis of language, region and humanity, Mallika added. Women issues : “Unfortunately, Kannada literature is being viewed and discussed in terms of the religious identity of its creators. Pluralism should not be discussed on the basis of religion, but on the basis of the issues, including agriculture, administration, rehabilitation, education, economy, caste and gender-based discrimination, expressed in the form of literature,” she said. The position of women, children and the working classes need to be discussed during the conventions like Nudisiri. The issues involving them should not be analysed on the basis of religion but need to be delineated on the basis of social, economic and linguistic grounds. Pakistani poet Ghanshyam Agarwal’s poem, Mallika declared that writers were equally responsible as the administrators in preventing the spread of hatred and violence in society. Highlighting the dreams and aspiration of Dalits, she said the ambition of Dalit families to get their children educated in English medium schools is natural as they were subjected to discrimination for a long time. They see English medium education as the light at the end of the tunnel. Like other parents, they too expect their children to secure good jobs. But, the English medium education institutions were converting the parents’ concern into capitalism. “There is a huge dichotomy between government, semi-government, private and central government institutions. The private education institutions have emerged stronger enough to control the government. There is a need to widely discuss the social responsibility of such institutions,” she stressed. Education, health, food and housing sectors should be nationalised so that the end person in the society gets access to all these facilities, Mallika said. Researcher Sha Shetter, in his inaugural address, apologised for having taught lies and cheating students for the past 45 years. “When it comes to history, we have believed in what others have said. In reality, there are many such false conclusions in the history which need to be set right. There is a need to see history from a new perspective,” he stressed. Shettar said that no language should be hated. When all the languages are together, there will be pluralism and literature represents pluralism. If the government censorship decides what has to be written and what not to be written, it is unfortunate. “Stifling the voices of writers is unacceptable,” he declared. 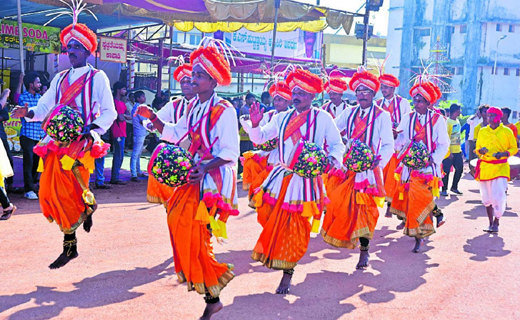 Alva’s Education Foundation (AEF) Chairman Dr M Mohan Alva, in his keynote address, said Alva’s Nudisiri, which was in its 15th year, had attracted 32,000 representatives from across the state. “The 15th edition of the Nudisiri is special for me as my father Mijaru Ananda Alva is celebrating his 100th birthday,” he said. Besides literary and cultural festivities, ‘Chitra Siri’, ‘Krishi Siri’ and ‘Vidyarthi Siri’ are also held simultaneously to motivate artists, agriculturists and students. Moodbidri MLA A Umanath Kotian, former MLA K Abhayachandra Jain, Dakishna Kannada district Kannada Sahitya Parishat president Pradeep Kumar Kalkura among others were present. ‘Nudi Nuditha’, a work by former All India Radio Senior Announcer and writer Narayani Damodar was released by the dignitaries on the occasion. 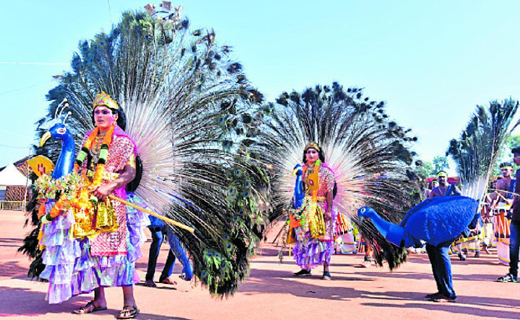 Colourful inauguration : Prior to the inauguration of three-day literary and cultural extravaganza, a colourful procession, accompanied by various folk and cultural troupes, was taken out. 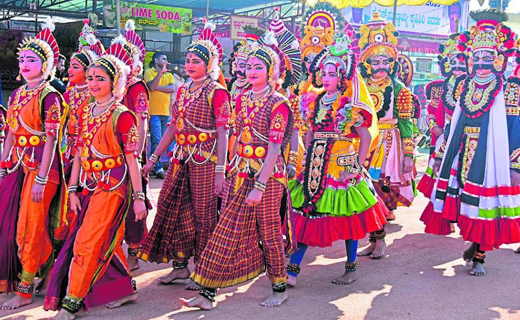 The procession featured around 50 folk and cultural troupes including ‘Nandi Dhwaja’ , ‘Nadaswara’, ‘Tattiraya’, ‘Huli Vesha’, ‘Goravara Kunita’, ‘Veerabhadrana Kunita’, ‘Maragalu’, ‘Bendara Kunita’, ‘Shringari Mela’ of Kerala, ‘Dhol Chalom’ of Manipur, Gumte Dance, ‘Puravanthike’, ‘Teyyam’ and ‘Panchavadya ‘ among others. Palanquin containing books was carried to the main stage. The guests and the dignitaries lighted the lamp and later poured milk on paddy sheaves to formally inaugurate the programme. 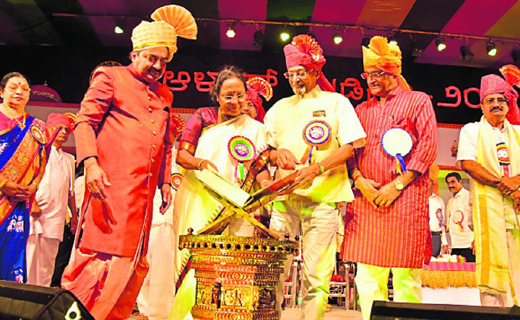 Nudisiri president Dr Mallika S Ghanti symbolically opened a book and placed it on ‘Vyasapeetha’, a traditional book stand.